Learn how to make a zigzag part in this Howcast hair tutorial featuring celebrity hairstylist Jacqueline Bush. OK. So this is how you make a zigzag part. What I like to do is start wet, because, depending on your hairs natural part, you can get a little more control over which way you want the hair to go, it&apos;s better to start wet. So, the first thing, to find your own natural part is, you want to brush your hair back, like I&apos;m brushing Monica&apos;s, with a wide tooth comb for her because her hair is very fine and tangles easily. Once you get it all back, then what you want to do is just simply push the hair forward lightly so I can see where the hair is naturally falling‚ like Monica&apos;s wants to go about here. So already her natural part is slightly off-center. Once we get that into place, if you start at the base of where your natural part is, it&apos;s going to be a little bit easier for you to manage. If you go too much off-center, you&apos;re going to be fighting a losing battle all day. So, we&apos;ve got Monica&apos;s natural part going, then I want to take a rat tail comb. A rat tail comb is something with a very long end, and so what this can do, is as I go through the part, because it has this long end, you can go all the way through without having to stop, whereas, if I had started with this comb, it&apos;s only going to lead me half-way through. When you&apos;re running around in the morning, the last thing you want to do is take longer with your hair. I&apos;m going to take the long end of my rat tail comb and start at the front and just make a zigzag shape. Now Monica&apos;s going to put her head forward and as you can see we have a slight zigzag shape. Perhaps it&apos;s not quite the way I want it, so, judging on Monica&apos;s face shape, maybe I just want a little bit more up front. Now, and this depends on your cut, and this is where you can eye what works best for you. I think this might look a little bit better on Monica, and perhaps not as extreme. Once I have my part in place, the trick to getting this to stay, is now I&apos;m just going to blow-dry with this part in place. OK. So when I blow-dry, and as I said, you&apos;re going to blow-dry with the part in place, I&apos;m just going to take my round brush, and with a small section‚ this is the most important part‚ so if you want to do this first, you&apos;re going to take your brush, for Monica&apos;s I&apos;m using a big round brush because she wants a little more lift at her roots, and I&apos;m just going to blow-dry with the blow-dryer parallel‚ not straight on. Parallel is going to get rid of the frizz and it&apos;s going to place it along the cuticle because that&apos;s going to get the hair to lie smoothly. And so as I blow-dry in that motion, that&apos;s what&apos;s going to set it and keep the hair in place. Then I&apos;m going to do the same for this section‚ this section‚ and this section. OK. So I just finished drying Monica&apos;s hair and as you can see, as Monica tilts her head forward, the zigzag part is still there. Now, for Monica, it was really easy to get this because her hair is very malleable, and really, it wants to do whatever I want it to do. But if you&apos;re somebody whose part is more resistant, say you have a cow-lick, or another kind of floral pattern in the head, that can make it more difficult. 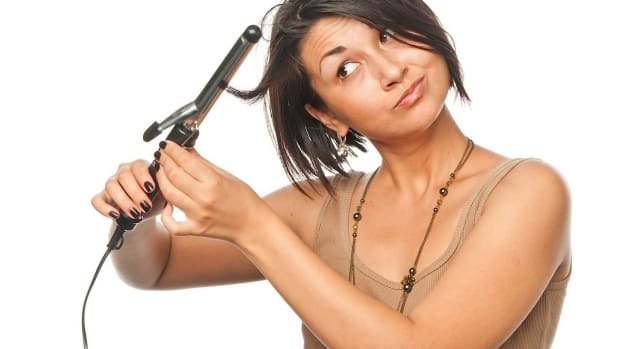 Another trick that you can do at the very end, take your blow-dryer; take a brush, it can be a round brush. It can be a flat brush. I love the Mason Pearsonbecause it&apos;s really good for smoothing, and you take a section of hair. Take your flat brush, before you blow dry, you&apos;re going to spray a little hairspray and then you&apos;re going to blow-dry that on hot, and then you&apos;re going to change the blow-dry button and put it on cold. So I&apos;m going to show you on just this little section on Monica. So now what I&apos;ve done, you can see there&apos;s just a small difference between this side and this side where it&apos;s just a little bit stiffer, and if you have a resistant part, you&apos;re going to want to do that extra trick at the end. So again, that&apos;s blow-drying it with a little hairspray, on hot, and then the cold button. What that does is lock in wherever you&apos;ve made that hairspray. So, that&apos;s how you make a zigzag part.